You are not safe. Safety is an illusion because it does not exist. Is your job a safe bet? Will you work in one company until you retire or burn out? Will you have a state-provided pension for a post-labor life in dignity? No. No. No. You are a grown-up of 18 years (respectively 21). You leave your parent’s house to enter your “employer’s house”. You are of full age and on your own. Your decisions have consequences for your own life. No backup daddy or mommy. Only the world and you. Still, in your adult life the first steps you take is a run for shelter under your employer’s roof. Why? How is it possible that you accept the responsibilities that come with attaining full age at 18 but do not see that an employer is not your family taking care of you? Your employer wants your workforce and the least amount of trouble with you. Do not bother him or he will bother back. If you „misbehave“ he will fire you. Your existence in being part of a Western World’s society depends on an employer who does not care about you. He is interested in hiring the right people to help him accomplish his mission, make profits and stay sustainable and liquid forever. If you become a dead wheel you end up on the scrap pile. Your employer is not a charity organization or funded by the state. You work in a company where the amount of money in your employer’s bank and the interaction with his customers and partners count. Nothing more. You play a minor role. You are a mean to an end. You are replaceable. I am not generalizing. I am making you aware of what you knew before. If you do not perform at the desired rate over an agreed period of time, you are out. Bye bye. Fired! Why you got kicked out? Because you put yourself into the hands of someone else — your ex-boss. You were longing for a position where you feel comfortable and taken care of. Even when you were sick you still got paid because you had a monthly salary. Your ex took care of your money, and your existence was in the hands of a single person making executive decisions. What about your execution? You were sure he would care for you, singing you a lullaby while you are laying in the cradle. None of that happened. You were day-dreaming and did not meet the monthly goal. So, you were politely asked to leave the company and not return. This goes on forever and ever until you retire and receive your reward. Wait! What reward? You cannot mean pension because there is none for you. You relied on a state in debt and being corrupt, saved money on your bank that now got bankrupt, and trusted in your 401K pension plan (that crashed) so you have no money in your hand (only debt). You crashed because you made yourself dependent on others. Take care how you make money so you can take care of your life. The money lies on the street. The problem: The money does not belong to you and you do not want to steel. Only its temporary owner can pick it up and give it to you. When you are wired to this owner you have a steady stream of income if you continue to provide value. Provide how? With the tools that exist and you have access to. Continue reading. You do not have to understand the implications of the democratization of the means to produce, only keep in mind that you live in an age where the factory is at your disposal. Any product you think of you can create. Everything is available to you at any time. Poor you if cannot think big and see what possibilties out there. I know. An abundance of options can abundantly paralyze you. You are in shock. The wave hit you hard. You are running after what is possible, never ahead. An endless hamster wheel with no way for you to take the lead. But that is not the problem. It is ok to be a number 2. If you do not like to be on the front page it is actually more pleasing that no popular press is paying attention to you. Still, this is not the problem. You can be number 79 and it would all be good — under one condition: You understood that democracy in the realm of product production and immediate access to the assembly line is the most practical mindset to emancipate from someone ruling over you. Ready for the next step? In the last decade being an entrepreneur has become a popular lifestyle. You work on your own schedule, refine your products and keep the vibes with your clients in a positive swing. Plan A is your only bet. You leave yourself with no room for doubt and no B. No alternatives, no other options. Whereas the realization of your democratic power is the foundation, recognizing your entrepreneurial spirit is the force to lead a full life of self-determination. When you are in charge of every aspect of your life, you truly turned 18 and became a grown-up. If you let any variable be influenced by another controlling force, you are playing a risky game. Some people are 50 years young and only recently uncovered what self-determination means to them. They apply it by 50, 60 or 80 percent. Ideally, you always want to go full force. Always aim for 100 percent self-determination! 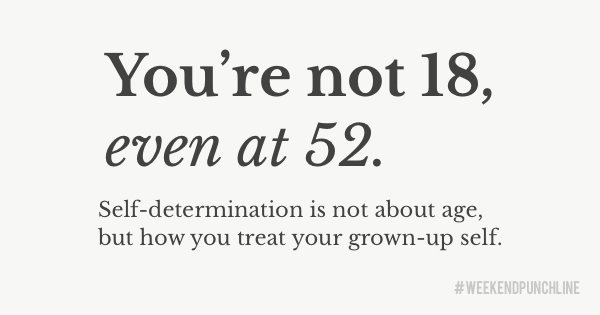 That is when you really take advantage of your full age and your status of a grown-up. The finished cake is your legacy to the world after your death. Better make it delicious, will you? You took control because you reached intellectual emancipation. You stopped being under the influence of another force and therefore avoided the danger of being on auto pilot — guided by someone or something — with no manual control for you. Even during your executed manifestation of self-control another controller can creep into your agenda if you decided you do not want to lead your life anymore. This is a subtle process, you almost do not recognize. By then the scepter is already in someone else’s hand, now ruling over your life as you gave up the lead. Whoever or whatever drives you then can also drive you crazy. That is why intentionality and consciousness about your actions is key. Every piece of your life needs to happen with awareness. When you are intentional and fully aware of the present moment you shine and flow. Real-world example: In a 2014 weekend monk retreat in Chiang Mai, Thailand I was taught to become aware of my current action and preparing myself for the action after, even announcing what action I will take. I said it out loud instructed by a Buddhist monk. I reckon you should give it a try. Peace! This was episode 21 of the #weekendpunchline . Every Saturday and Sunday.